Xarray is an open source project and Python package that extends the labeled data functionality of Pandas to N-dimensional array-like datasets. It shares a similar API to NumPy and Pandas and supports both Dask and NumPy arrays under the hood. We will use some of xarray’s tutorial data for this example. By specifying the chunk shape, xarray will automatically create Dask arrays for each data variable in the Dataset. In xarray, Datasets are dict-like container of labeled arrays, analogous to the pandas.DataFrame. Note that we’re taking advantage of xarray’s dimension labels when specifying chunk shapes. 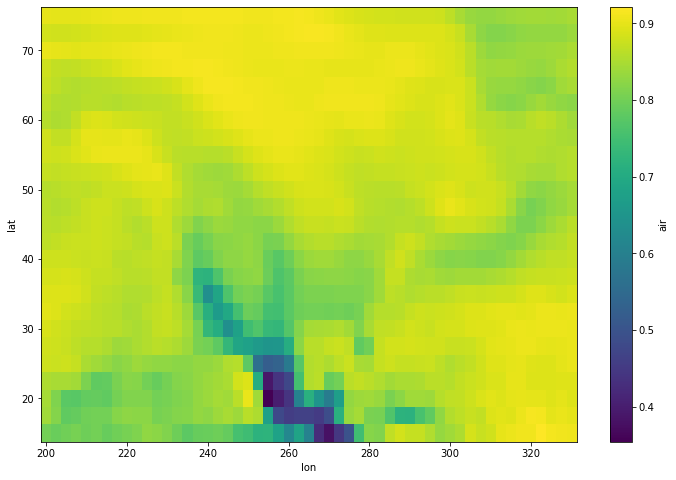 Quickly inspecting the Dataset above, we’ll note that this Dataset has three dimensions akin to axes in NumPy (lat, lon, and time), three coordinate variables akin to pandas.Index objects (also named lat, lon, and time), and one data variable (air). Xarray also holds Dataset specific metadata in as attributes. Each data variable in xarray is called a DataArray. These are the fundemental labeled array object in xarray. 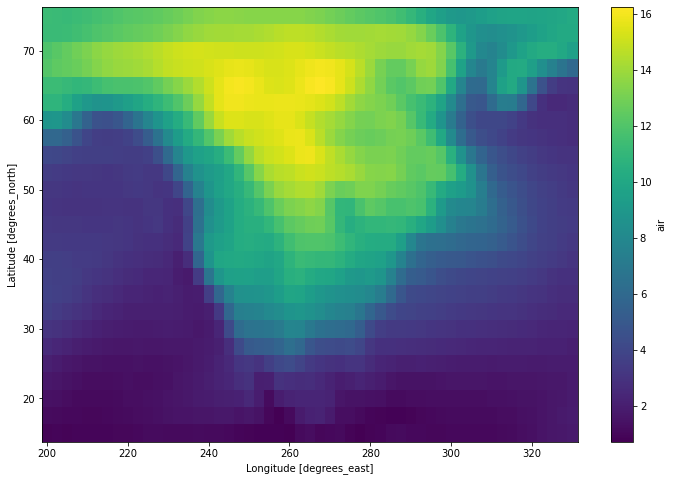 Much like the Dataset, DataArrays also have dimensions and coordinates that support many of its label-based opperations. Accessing the underlying array of data is done via the data property. Here we can see that we have a Dask array. If this array were to be backed by a NumPy array, this property would point to the actual values in the array. In almost all cases, operations using xarray objects are identical, regardless if the underlying data is stored as a Dask array or a NumPy array. Call .compute() or .load() when you want your result as a xarray.DataArray with data stored as NumPy arrays. Since xarray stores each of its coordinate variables in memory, slicing by label is trivial and entirely lazy. Almost all of xarray’s built-in operations work on Dask arrays. If you want to use a function that isn’t wrapped by xarray, one option is to extract Dask arrays from xarray objects (.data) and use Dask directly. Another option is to use xarray’s apply_ufunc() function, which can automate embarrassingly parallel “map” type operations where a functions written for processing NumPy arrays should be repeatedly applied to xarray objects containing Dask arrays. It works similarly to dask.array.map_blocks() and dask.array.atop(), but without requiring an intermediate layer of abstraction. In the examples above, we were working with an some air temperature data. For this example, we’ll calculate the spearman correlation using the raw air temperature data with the smoothed version that we also created (da_smooth). For this, we’ll also have to rechunk the data ahead of time.